In the past we have shown you how to automatically convert keywords into links to increase your profits and save time. Wouldn’t it be easier, if we can automate yet another thing in our blog to save more time? 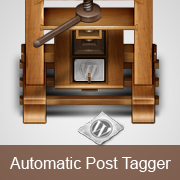 Well, recently one of our users, Devtard, notified us of his new free plugin called Automatic Post Tagger. It allows you to automatically tag your WordPress posts with pre-defined tags. Let’s take a look at how it works. All you have to do is create a list of tags with related words for each of them. Once you do that, then this plugin will automatically add tags to posts according to the keywords found in the title, content, and excerpt. For example, you can add the tag “cat” to a post if the following keywords are found: cats, kitty, meow, etc. You can also set a maximum number of tags per post. This plugin has the ability to bulk tag your existing posts. Last but not least, you can easily import or export your tags list. Hopefully as this plugin grows, other folks will openly share their tag keyword database allowing new bloggers to take advantage of it. Overall, it is a very neat solution for bloggers who want to save some time. First thing you need to do is install and activate Automatic Post Tagger plugin. Upon activation, you will see a new item under your Settings menu called Automatic Post Tagger. Most of the configuration settings are pretty self explanatory. We suggest you leave the default settings as-is because they look pretty good. You can add tag name and keywords from either the settings page, or you can add it from your posts write panel. Remember to read our article about Categories vs. Tags – SEO Best Practices for Sorting your Content. What are your thoughts about this plugin? Will you be using it on your site? Let us know in the comments. I need a plugin that can automatically generate tags with me adding any related word for that. When you say Cats tags do you mean that where ever the keywords are found it will add a tag “cat” to that post. So hence the TAG Name will become the new tag for those keywords? Is this correct that all the keywords you put in if they are in the article then the posts will have the word cat added into the tags? I was looking for auto tag plugin that can auto tag custom post. I think someone had asked this but no response. Can this auto tagger do the job? Or is there any wp plugin that can. Hello there I am just starting a new blog but I am not finding out the way to automatically link some of my SEO on various posts and to show related posts too. See how to install and setup WordPress SEO plugin. For related posts see our list of 5 best related posts plugins for WordPress. Do you think it would also work at Custom Post Types with a Tags Taxonomy attached to them? Asking this because I was thinking of using it or maybe change it a little if possible so it would work at the bbPress plugin. Topics inside bbPress forums plugin are also some kinda Posts like WP and have a Tagging feature. Only problem is, if you let members submit Tags manually to topics it becomes a spammy system very quickly – I don’t believe in the entire use Tags as SEO thing , I see them more as great navigational -/filtering element to your content if you pick your Tags very carefully and don’t overdo them. I saw this Live example at Zurb’s Forum. They also add Tags automatically underneath each topic based on what element of Foundation you’re asking a question about. I love this idea so much, very clean and simple but also extreme great navigation wise and for listing specific topics. Thanks! I had to install and then delete a few “automatic” tagging plugins because they didn’t work or didn’t add value. This is awesome, especially because you can also import your current tags to save you time populating your tag database! HIGHLY RECOMMENDED! How do i upload the Automatic Post Tagger into ‘/wp-content/plugins’? I don’t even know where that is or even how to get there in the first place. Thanks so much for sharing, this plugin totally rocks!